For those of you who are traveling in Yogyakarta, there are several easy ways to go to Mount Bromo via the city of Probolinggo. 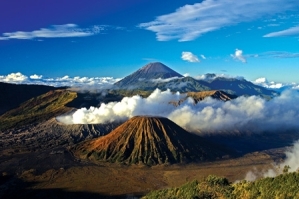 After you complete Jogja tours and visit many tourist attractions in Yogyakarta, the next tour plan is to climb Mount Bromo and enjoy the beauty of Mount Bromo sunrise. The city of Probolinggo is located in East Java province, about 415 kilometers from the city of Yogyakarta. Here are some of the transportation that we recommend for travelers. Pick up at the hotel starting at 8 a.m.
Cities on the island of Java are already connected by trains. Trains are the preferred transportation for travelers. There are three classes of train carriages in Indonesia, namely economic, business and executive classes. All classes are equipped with air conditioning and toilets. The difference between each class is the type of passenger seat. Economic classes with permanent benches cannot be laid down and face each other. Business Class with parallel benches can be laid down and facing one direction forward, legroom is narrower than the executive class. The executive class has a soft bench, can be laid down and rotated in two directions. In addition to toilets, each bench is equipped with electricity and television in front of the carriage. Sri Tanjung Train, departing from Lempuyangan station at 07 a.m. in the morning. Available classes are only economic with a travel time of 9 hours 10 minutes. The Logawa Train, departing from Lempuyangan station at 08:27 a.m. The available classes are only economic with a travel time of 8 hours 38 minutes. Ranggajati Train, departs from Tugu Station at 09:55 a.m. Available class are business and executive with a travel time of 8 hours 18 minutes. Wijayakusuma Train, departing from Tugu Station at 06:16 p.m. Available class are economic and executive with a travel time of 8 hours 5 minutes. After arriving in the city of Probolinggo, you can do a trip to Mount Bromo yourself or use the services of a travel agent with a tour package of transportation and accommodation.